Joe Posnanski has done it again. The most recent issue of Sports Illustrated has Poz’s sit-down interview with Albert Pujols, addressing (what else) his stance and defiance about steroid use. It is an excellent read, and I advise any Cardinal fan to read it through. Now, I realize that recent history and the now-fractured trust we had in our heroes like Alex Rodriguez, who was supposed to be the one that kept baseball above water in the Steroid Era, the one who would restore all of the records to “clean” status, dictates suspicion of Pujols. In fact, I wrote as much a couple of weeks ago when the ARod scandal went down. There are many people, some die-hard Cardinal fans included, that exalt Albert’s numbers and exploits on the baseball field, but are convinced that unless proven otherwise – Pujols is guilty. It is an unfortunate, but widely accepted viewpoint with regard to steroid use and its correlation with success hitting a baseball the way Pujols has. Guilty until proven innoncent. And why not? Everyone that was assumed or has loudly claimed innocence has been proven guilty! ARod? Admitted. Andy Pettitte? Mitchell Report, then admission. Rafael Palmeiro? Failed test. Barry Bonds? Roger Clemens? Ok, maybe not 100% proven, but what more do we need to know? There are things we do not know about Pujols, things we cannot know, but the question really is this: How much fun is it if you cannot believe? 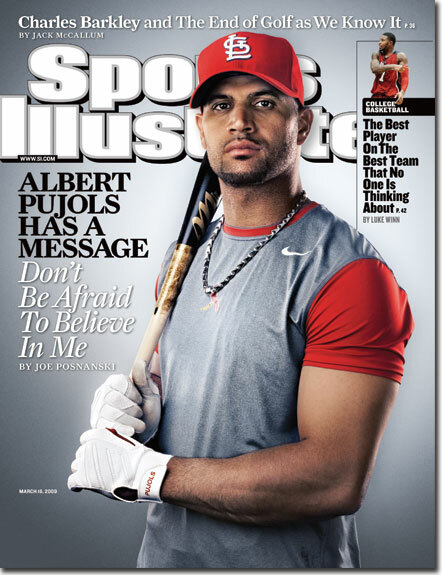 I believe in Albert Pujols. “If he ever got involved in that [steroid] stuff, I would be the first one to kill him,” Dee Dee says suddenly. If he wants to be a hero, there’s one sure way to do it. Stay away from the juice, El Hombre. Step around the Players Association and go get tested independently, make good on your promise. Do it three or four times. Donald Fehr doesn’t own you. Prove me right. I couldn’t agree more, and I blogged about this very thing yesterday. Good post. Thanks Chris – It really boils down to what you *want* to believe, in my mind. I want to believe that Pujols is clean, and I will believe that until proven otherwise. Naive? Possibly, but it’s one of the things that must happen for baseball to emerge from this stain on it’s history. I’m not afraid, either, and it doesn’t matter to me whether it’s *ever* proven one way or the other. Indeed Sarah. Sooner or later, we’re going to have to believe someone that plays at an incredibly high level is clean. Why not Albert? On an unrelated note, I hate that picture of him. He looks ill.